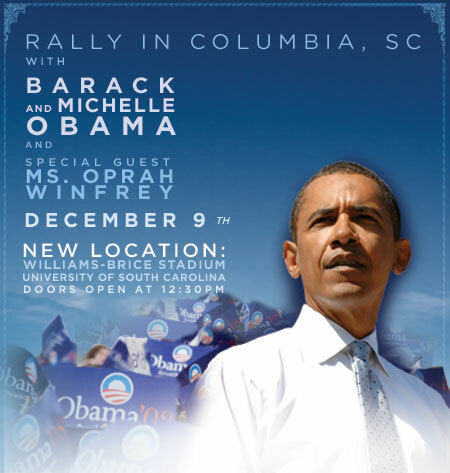 On Sunday 12:30pm EST/ 9:30am PST LIVE on Ustream from the University of South Carolina, Senator Barack Obama, his wife Michelle and special guest Oprah Winfrey will speak to thousands of Obama campaign supporters at a Democratic political rally. The event, originally scheduled at an 18,000-seat arena, has generated so much buzz that it was moved to the 80,000-seat football stadium on the university campus. By streaming the event live on Ustream, the Obama campaign has the opportunity to reach an even broader audience from all around the country. One of four political rallies being held this weekend that will feature Democratic White House hopeful Senator Barack Obama, his wife Michelle and special guest Oprah Winfrey. Huge crowds are expected to attend both in-person and live on the Internet as talk show queen Oprah makes her campaign trail debut. Having Oprah on Ustream live is just another incredible example of amazing events in the world that, without live internet video, would not be seen live by the rest of the country. Sen. Obama has been a avid Ustreamer, his last stream being his “Open Foreign Policy Discussion“.